This is the Channel 8 weather forecast with Carol Gates. In the Southeast it will be cloudy and it might rain tomorrow in the morning but in the afternoon it'll clear up. You should probably bring your umbrella just in case. 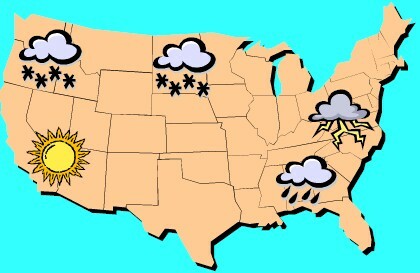 In the northern United States there's a 50% chance of snow. It might snow in the afternoon but it'll stop by evening. In the East we're expecting a big storm tomorrow. We'll have showers in the East tomorrow night and we might have some lightning. In the Northwest it'll be cold tomorrow with a chance of snow again. They've had a lot of snow this week. In the Southwest it'll be beautiful tomorrow. It'll be sunny and clear so enjoy your day. 1. might rain It in morning the tomorrow . 2. 50% snow chance There's of a . 3. East We'll night showers in have the tomorrow . 4. It'll chance cold again with a be of snow tomorrow . 5. be enjoy sunny and clear so day your It'll .